Spectacular Hanalei Bay, Kauai, Hawaii, the most beautiful Beach in the World is located on Kauai's scenic unspoiled North Shore just 7 minutes from the Princevile Resort. Enjoy white sand, turquoise water, and a stunning backdrop of Waterfalls, Rainbows, and Emerald Green Mountains. Fabulous hiking, diving, swimming, snorkeling, Surfing, body surfing, boogie boarding, Stand-Up Paddling, Kayaking, Sailing, Running or Walking on the Beach and unforgettable sunsets. Truly Paradise! Come see for yourself. This spacious, Tropical, Non-Smoking, Romantic, one bedroom beach house has a great location only a short stroll (1 minute walk/200 steps) to Hanalei Bay with great swimming and other activities listed above. It is an easy 10 minute walk to charming Hanalei Town shopping which includes a Supermarket, Health Food Store, and a variety of restaurants and interesting shops. Everyone's first reaction to our Hanalei Kauai Vacation Rental is: 'It's so spacious. It has an open airy feeling.' Newly and lovingly rebuilt, we decorated it in a tropical motif accented by Hawaiian Artwork. See Emerald Mountains, Waterfalls, Rainbows from the King-size Bed. Hear the ocean beckoning! Just steps away! Just bring your swimsuit! Hanalei awaits! Your hostess is a Yoga Teacher, Personal Fitness Trainer, and Massage Therapist specializing in Hawaiian LomiLomi Massage as well as Swedish-Esalen and Deep Tissue. Start your vacation with a relaxing Massage and/or Yoga Lesson. Personal Fitness Training outside in nature on Beautiful Kauai or Traditional Fitness Training available. Very near the Beach in Hanalei Bay! I sailed into Hanalei on a Full Moon night in 1976. It was the most beautiful place I had ever seen by moonlight & when I awakened the next morning to see the long stretch of white sand, the crescent shaped Bay, the Emerald Green Mountains I knew I had found the place I wanted to live for the rest of my life. I spent the next 4 summers there before I left my dear friends & home in Pt. Dume, Malibu in 1980. I was sad to leave my Yoga Students, family, & friends, but now I have my Kauai Yoga Students, family, friends. Kauai welcomed me with it's warm Aloha & a wonderfully rewarding job. I started teaching Tai Chi, Yoga, & Massage at Kauai Community College so that I was able to do what I love & feel able to serve the community, meeting people from all over the island from all walks of life. I love Hanalei Sunsets so I walk, run, swim, surf, or Boogie Board every evening at Sunset. It is a 1 minute walk to Hanalei Bay & Beach, my favorite beach in the world. I have always loved being in the Ocean, but California was too cold for me so I spent time in other Tropical Paradises that were great for a vacation, but not places I could call home. This is home and I would love to share it with you. I love the Beach & being in the warm ocean and I don't love driving. I can walk to the beach in 1 minute or to Hanalei Village in 10 minutes. Everything I need or want is in Hanalei. This is a place to relax & enjoy the healthy Hanalei lifestyle. There is a Hanalei Farmer's Market twice a week where you can get great local produce. There are Fruit, Juice, & smoothie Bars, Harvest Health Food Store, all within a 10 minute walk from your Vacation Rental. Devaki is available for Hawaiian LomiLomi, Deep Tissue, & other forms of Massage. Devaki also teaches Massage if you want to learn. Devaki teaches Private Yoga Lessons for one person, couples, or small groups & Yoga Teacher Training. Devaki was a longtime student of Indra Devi, the First Lady of Yoga as well as Swami Vishnudevananda & completed Yoga Teacher Trainings with both. Roomy well lit bathroom with large mirrored wall over sink & vanity. Lighted magnifying mirror. 5 high windows for great airflow without giving up privacy. Adjustable Ceiling Fan in bathroom & every room. All lights fully adjustable with dimmer switches. so you can choose romantic or bright light. Hanalei Bay's long crescent shaped white sand beach is perfect for long romantic walks, athletic runs, relaxing with a book, or just watching the most amazing sunsets in the world. Princeville Resort is a 7 minute drive away. Roomy Living Room Area with couch. 2 matching chairs, coffee table, 2 end tables. 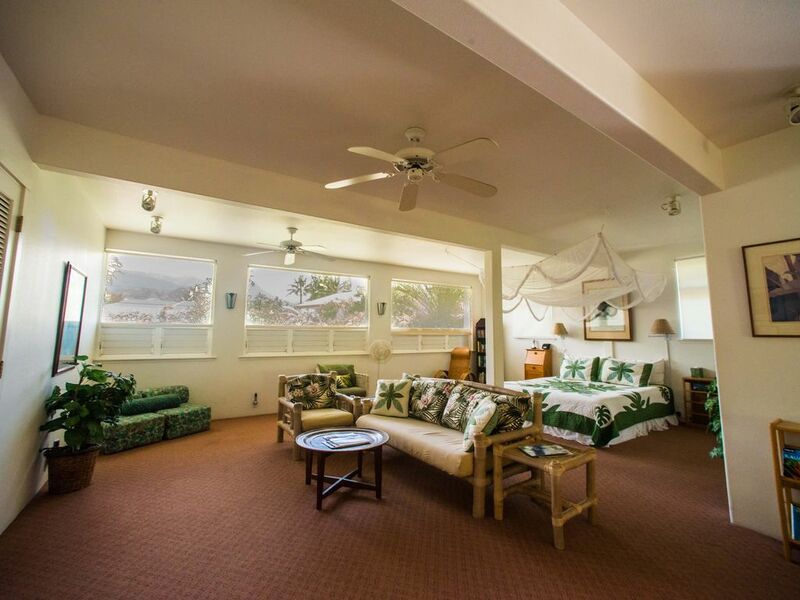 Big windows for Trade Wind breezes, views of Hanalei Mountains, Waterfalls, Rainbows. Ceiling Fans & movable fan. Designer Cabinets, Franke Sink & TriFlow Filtration System Faucet. Adjustable lighting & adjustable Ceiling Fan in kitchen & all rooms. View of Hanalei Mountains, Waterfalls, Rainbows from round rattan dining table. Hawaiian Music, Jazz Collection, Etc. Covered Lanai/Deck with Gas BBQ Grill, patio table, chairs, Chaise Lounge. Water sports gear available for rent in Hanalei. Great location, had everything we needed, in the heart of beautiful Hanalai !! Easy, spacious, great proximity to Beach and Town. Love the vibe of this location so much! Felt well cared for by Devaki. The location was excellent being a very short walk to the beach and also some good restaurants and spots to rent equipment. The place was large, bright and clean and Devaki was very responsive. Checking in/out was easy and finding the location was no trouble at all. This unit is spacious, comfortable, and located with an easy two minute walk to the beach and five minute walk to Hanalei town for groceries, restaurants, etc. Lots of great natural light and views of the mountains. We thoroughly enjoyed our stay in Hanalei. The cottage was cozy, clean and an excellent location. We loved our proximity to the beach and downtown Hanalei. We would definetely recommend this property! Surfing, Boogie Boarding, Body Surfing, Stand-up Paddling, Snorkeling, Swimming, Beautiful Beach Walks & Runs, amazing Sunsets over Spectacular Hanalei Bay from Beach.